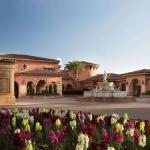 Multiple pools and restaurants spa services golfing and quick routes to I-5 make the non-smoking Fairmont Grand del Mar a sweet California choice. All 249 rooms at the three-story Fairmont Grand del Mar come with down pillows coffeemakers flat-panel LCD TVs free Wi-Fi and bathrooms with marble sinks and deep soaking tubs. Guests have six restaurants to choose from. Year-round pluses include four heated outdoor pools a golf course tennis courts and free fitness classes in the 24-hour gym. Pamper yourself in the in-house spa complete with signature teas and fireplaces. The hotel also provides a business center plus free on-site parking. Pets are allowed. This Fairmont lands guests in Carmel Valley 21 miles north of the Gaslamp Quarter in downtown San Diego and less than three miles east of I-5. Take the kids on a fun-filled aquatic adventure at SeaWorld San Diego 18 miles away or hit La Jolla's beach within a 25-minute jaunt. The hotel is also within 40 miles north of Tijuana and 21 miles from San Diego International Airport.